There are few items in the culinary spectrum that induce the level of overwhelming, must-have-right-this-minute craving that I feel when the smell of a freshly baked pizza wafts in my direction. Equal parts doughy, greasy and cheesy, pizza has that trifecta of temptation down pat. Toronto's east side is brimming with saliva-inducing slices, from the ever-popular classic joints like Danforth Pizza House and Pizza Pide to higher end selections like Queen Margherita Pizza (the original east end purveyor of "gourmet" pizza). That being said, there are also a number of lesser known, under the radar joints that are well worth a visit, offering up ooey-gooey goodness. Here are a few of my favorite places to quench my pizza craving. Diamond Pizza has been around since the late 70s, serving up hot slices of cheesy goodness to the East Danforth crowd. Their selection of specialty slices are limited, including the relatively common Deluxe Slice ($3.49, pepperoni, green peppers, mushrooms) or a tangy Hawaiian Slice ($3.49, ham, pineapple) but the selection of ingredients available for whole pizzas are plentiful. As a meat lover, I can't help but indulge in the Hot Italian Sausage, paired with Spanish onion, hot peppers and mushrooms. Not just for the pizza lover, Diamond offers up seriously tasty souvlaki, pasta and subs. One might genuinely deem Bona Pizza a hole in the wall. The small, take-out spot at the corner of Donlands and O'Connor is nothing special to look at, but when it comes to the variety of its pizza Bona has pretty much anything you'd ever consider layering on top except perhaps caviar and foie gras. Just about every type of onion, olive, chicken, beef, seafood, tomato option out there is on the menu. No wonder it's one of the most popular delivery places in East York. A particular favorite is the Danforth Pizza ($16 for a 12" and topped with Italian sausage, black olives, feta cheese, spanish onion, fresh garlic and diced tomatoes) or the Magic Pizza (same price, sauteed onions, roasted peppers, sundried tomatoes, chilli flakes, oregano, romano cheese and tomato sauce). Though slightly off the beaten track, Tommaso's Trattoria on Eastern Avenue serves up serious Italian, just like nonna used to make. Tommaso definitely knows how to entice with his popular lunch time hot table, but the classic pies here should not be overlooked. Thin crust slices feature traditional Italian ingredients like my personal favorite, the oozey Arugula, Parmigiano and Paccino which comes sans tomato sauce unless requested ($12 for a personal size). Meat lovers will get a kick out of the Diavola ($12) which features tomato sauce,mozzarella, basil and homemade Italian sausage, or the Capricciosa ($14) with nice thinly cut slices of Prosciutto. Don't be fooled by the white cloth napkins and tacky decor. This local haunt serves up classic Italian food to the beach bums of the east end. With a huge patio out front, this Queen Street East spot has long been a place I frequent when catching a flick at the Beaches Cinema across the street. Though the selection of classic appetizers (mmm fried calamari), salads and pastas are worth a look, the pizza selection is killer (though by-the-slice is not an option). The Firenze (starting at $16.25 for 11") is one of those pizzas that I find myself craving on a regular basis, featuring mozzarella, tomato sauce, spinach, grilled eggplant, grilled zucchini, goat cheese and a heavy dose of oregano. It's hearty and filling, but not too heavy. 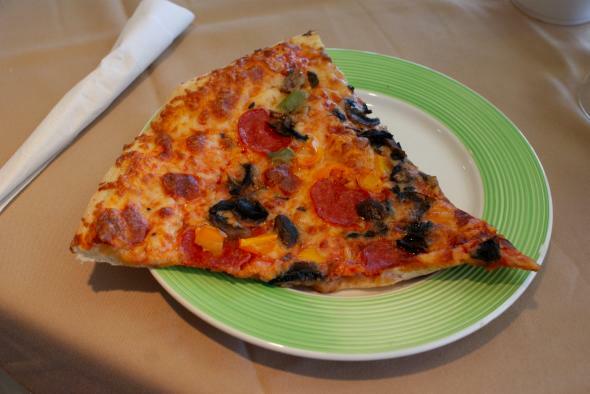 The lone Halal pizza joint on the list, Arza Pizza is nestled in the heart of Thorncliffe Park. Sparing on the frills, and specializing in mostly take-out or delivery, Arza may not be "authentically Italian," but it's definitely tasty. The classic toppings are all available and they offer up some hard-to-say-no-to deals, like a daily lunch special which offers a personal-size 3-topping pizza, choice of 5 wings or a chicken leg and a pop for $5.99. While you're grabbing a slice, try out Arza's traditional Lahori-style fish ($3.99) and chicken($8.99 for a whole/ $2.00 for a leg).